I’ve been using Papertrail for a few months now, and absolutely love it. Being able to search logs across all my servers at once is crazy nice. I can even get alerts when someone logs in via SSH, which, by itself, has made Papertrail well worth it. A non-production server was compromised, due to a since-rectified configuration issue. Papertrail notified me almost immediately, allowing for immediate action to be taken. There’s a variety of pricing plans, and there’s even a free for life plan, which includes plenty of features for most folks. I’m currently on the free plan, but plan on upgrading soon. Adding more servers and will need the extra space at Papertrail. Do you use a log management service? 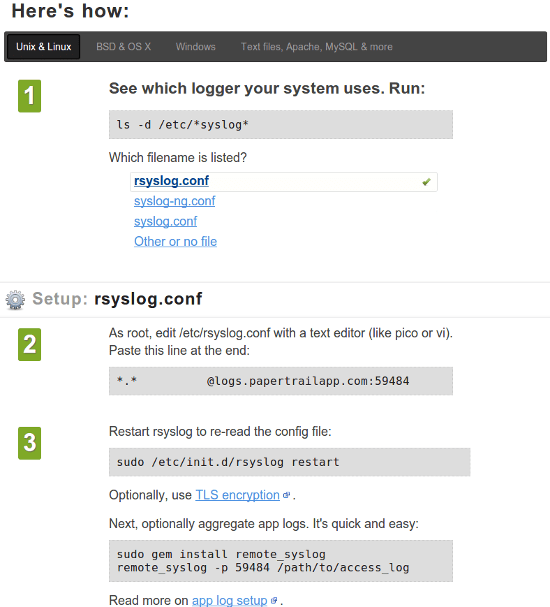 In addition to collecting logs from your servers, you can also send logs from your applications. Got a PHP application that’s erroring out for some reason? You can send that error to Papertrail for later investigation. Same deal with Apache logs, MySQL logs, and pretty much every other piece of software that generates logs. Not many limits on what you can configure Papertrail to do for you. It’s very powerful. I suggest you give it a try. Installation is super easy, especially if you’re using rsyslog. Below is a screenshot of their installation instructions. Doesn’t get much easier than that.